Quosal is a host of quoting and sales workflow automation tools that makes quoting and closing sales a lot easier and faster for small to medium size businesses. This is done with the system’s simple quote creation tools and effective channels for quote delivery. Quosal offers five different products, each designed to meet specific quotation and sales needs. Quosal Sell – creates accurate and professional quotes and proposals from anywhere at any time. Order Porter – speeds up closing process by enabling customers to say “yes” with their electronic signature. Quosal Mobile – gives quotes effectively on the spot using your mobile device. This helps you reduce the sales cycle and close more business. Quosal comes with a myriad of advantages for businesses who rely heavily on delivering quotes and proposals to their clients. If you are interested in Quosal it may also be a good idea to investigate other subcategories of Best Sales Proposal Automation Software listed in our base of B2B software reviews. It is crucial to keep in mind that hardly any app in the Sales Proposal Automation Software category will be a perfect solution able to match all the needs of various company types, sizes and industries. It may be a good idea to read a few Quosal reviews first as specific software can perform well exclusively in a very small group of applications or be prepared with a very specific industry in mind. Others can work with an idea of being easy and intuitive and as a result lack complex functionalities desired by more experienced users. You can also find solutions that support a large group of users and offer a powerful feature toolbox, but this usually comes at a higher cost of such a service. Ensure you're aware of your requirements so that you purchase a solution that has exactly the elements you search for. How Much Does Quosal Cost? We realize that when you make a decision to buy Sales Software it’s important not only to see how experts evaluate it in their reviews, but also to find out if the real people and companies that buy it are actually satisfied with the product. That’s why we’ve created our behavior-based Customer Satisfaction Algorithm™ that gathers customer reviews, comments and Quosal reviews across a wide range of social media sites. The data is then presented in an easy to digest form showing how many people had positive and negative experience with Quosal. With that information at hand you should be equipped to make an informed buying decision that you won’t regret. What are Quosal pricing details? What integrations are available for Quosal? 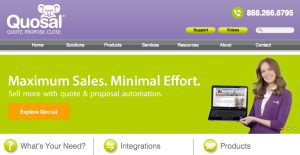 Pros: Quosal eliminates all guess work in the quoting process for our team which saves time through automation. It also helps import quotes from Dell without much hustle and thus reduces the data entry workload. When it comes to price comparison for your list of vendors, it provides real-time data to help you make the right decision on pricing. Cons: It is hectic to manipulate or update templates and forms, with the latest version of Quosal, the Quosal Sell. Apart from that deficiency, it requires major debugging in its fonts as they make it difficult to change the product description. Another drawback is the fact that you must generate and email a quote to see the final version which floods your inbox with a lot of emails to delete. Pros: The integration with Connectwise allows you to automate your business operations as it provides managed services. The templates it comes with help you to create professional basic quotes and save time in the quote process. The order porter feature the tool has equips it with the ability to approve quotes in real-time with minimum effort making it a convenient tool for any salesperson. It is equipped with etilize plugin responsible for collecting and comparing pricing data from the distributors in real-time and thus saves time regarding decision making. Cons: When it comes to integrating with Connectwise, Quosal has some major issues. Some features are complex and thus require more time to get used to especially if you are not familiar with the tool. It will require a professional to setup and configure the system as it is also complex. The features and functions of Quosal are biased to the managed service industry and thus may not work well in organizations which are not in this category.